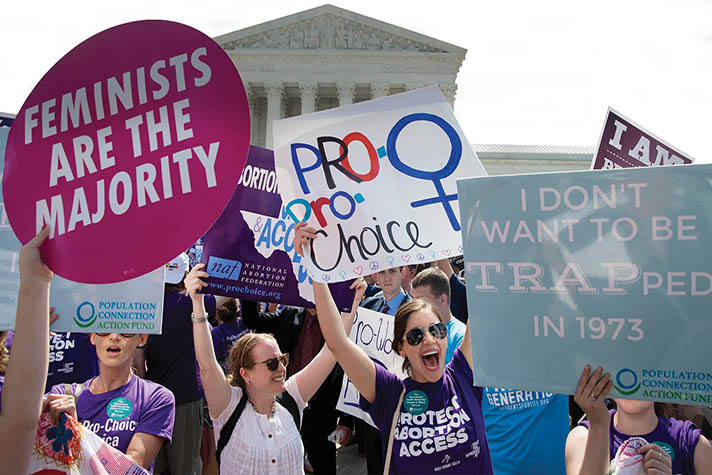 Pro-choice supporters celebrate outside the Supreme Court in Washington, D.C., after the court’s June 27 ruling in Whole Woman’s Health v. Hellerstedt, a case that reversed restrictions on abortion clinics in Texas. As we face the aftermath of the Supreme Court’s June decision in Whole Woman’s Health v. Hellerstedt—the Texas abortion case that invalidated common-sense abortion clinic regulations—the question of who succeeds President Obama becomes even more critical. After eight years of the most pro-abortion president in American history, we will either roll back the policies that he set in place, or see them solidified and deepened. 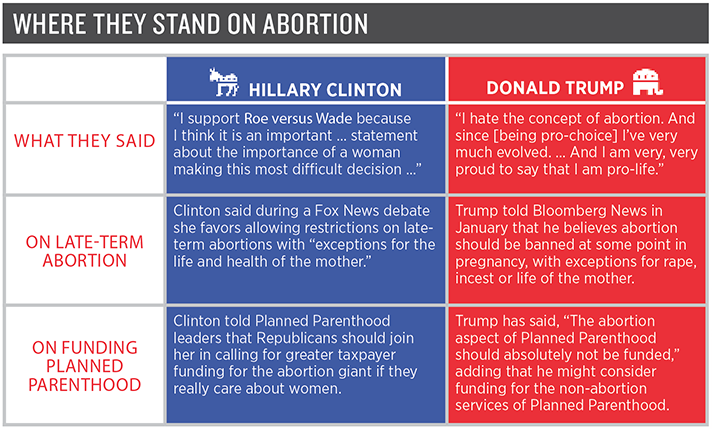 In looking at the two major candidates for president, there is a marked difference in how they address abortion and how the defense of life would be affected by their election. The Republican nominee, Donald Trump, has demonstrated unfamiliarity with the life issue, garnering substantial criticism after making statements he has corrected and walked back. But the public attention around Trump’s efforts to better develop his pro-life stance has obscured a corresponding radical consistency in Democrat nominee Hillary Clinton’s unbending commitment to advance abortion. Throughout her life in the public eye, Clinton has demonstrated an unwavering commitment to legalized abortion. She makes no effort to hide how central abortion is to her agenda, other than to reflexively refer to the preferred mantra of “reproductive health.” In fact, while Obama has worked to aggressively advance abortion, the issue is even more fundamental to Clinton’s core values and her motivation for political activism. Clinton’s commitment to abortion was clear in her speech on Jan. 10 after being endorsed by the Planned Parenthood Action Fund. Kicking off the event in front of a sea of women clad in hot pink T-shirts, Kelley Robinson, the national organizing deputy director of the Fund, announced that for the first time in the organization’s 100-year history, they were endorsing a presidential candidate in the primaries. Planned Parenthood President Cecile Richards came out on stage: “The stakes … have never been higher,” she said. “More than ever before we don’t need a friend, a solid vote, a statement. We need a fighter.” Then, she introduced Clinton, who strode onto the stage to accept the endorsement from the country’s largest abortion provider. She noted that the Republican Congress passed a bill to defund the organization. And then she drove home the point that “President Obama’s veto pen” stopped the bill. Still, words are easy. What assurance can pro-life Americans have that a Trump vote would save unborn lives? Look to his actions. 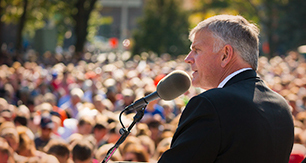 Far more important than a candidate’s slogans and speeches are the advisors they surround themselves with, and the appointments they will make. I served in the Reagan White House in presidential personnel. President Reagan’s credo was “personnel is policy.” The next president will almost certainly appoint at least four Supreme Court justices. But the political appointment process is significant beyond that. A new president must staff an administration with more than 3,000 appointees who will affect policy in every area of American life. As the trial balloons and interviews for vice presidential nominations were underway in the summer, every name mentioned to partner with Clinton was devoutly pro-abortion. Every name under consideration by Trump had solid pro-life credentials. Again, after eight years of the most pro-abortion president in American history, our choices seem abundantly clear: a continuation of a radical, pro-abortion agenda advancing its legality through nine months of pregnancy, or a course correction toward the sanctity of innocent human life. May voters choose prayerfully and wisely. Charmaine Yoest, Ph.D., a senior fellow at American Values in Washington, D.C., led a national pro-life organization for many years.